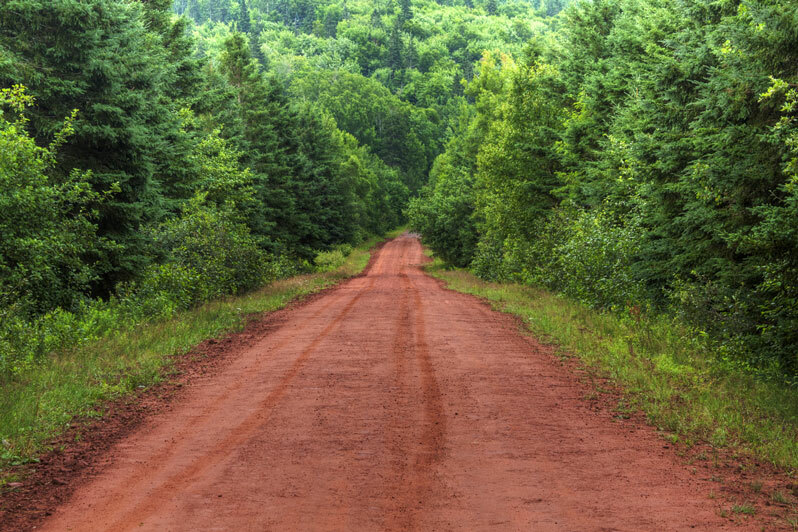 The materials that are used to construct American roads vary, but most roads contain common elements including the pavement, subsurface, shoulder, gutter, and curb. Pavement refers to the road surface which can be made of dirt, gravel, wood, stone, brick, macadam, concrete, or asphalt, while subsurface is the stabilized base on which the pavement is laid. A shoulder is a surface running parallel to, and flush with, the roadway that is often used alongside higher-speed roads. A gutter is often made of brick or concrete and is positioned to the outside edge of the roadway and used for catching rainwater. A curb is a raised edge, often 6 to 12 inches high, positioned at the edge of the gutter. 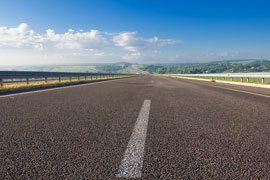 Road appearance and ease of travel varies according to the type of surface pavement used. 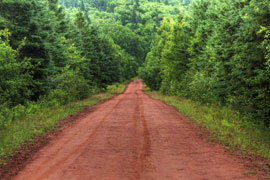 Concrete is laid over compact soil and crushed gravel and is considered one of the most durable road surface materials. 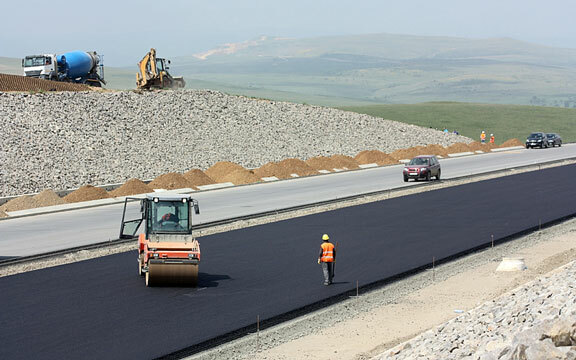 Uniform gravel laid over a gently sloped surface and compacted with a heavy roller forms macadam, which is often finished with a heavy layer of tar. Fitted pavers over a sandy subsurface create brick roads. 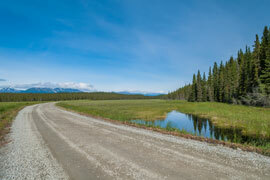 Corduroy roads are constructed of small-diameter logs laid cross-wise, a technique that was primarily used in the nineteenth century to facilitate navigation across marshy areas or streams. Plank roads use large squared logs or wooden boards nailed to runners forming a continuous road surface, and arose in the 1830s as an inexpensive alternative to macadam. Asphalt pavement was first used in New York in 1872, and is composed of tar or a similar substance mixed with pebbled rock. 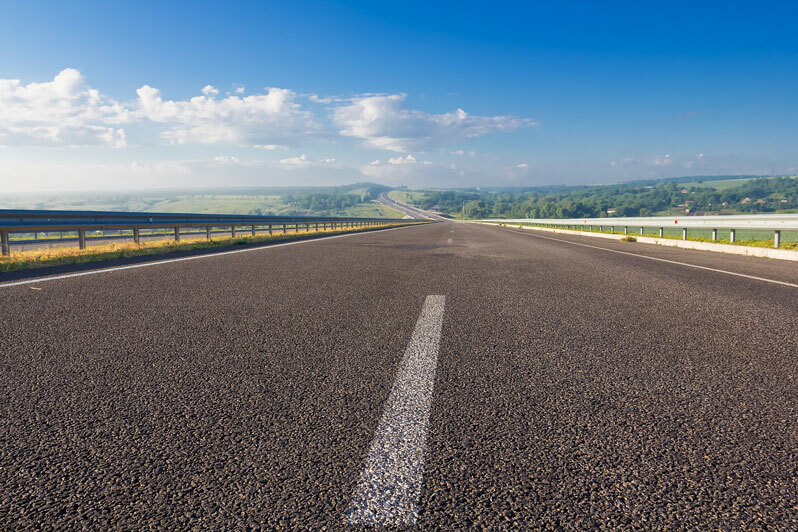 Because of its smooth surface, water resistance, and durability, asphalt is now used on 96% of the paved roads in the United States, which means there is a pretty good chance you will travel on one today! Modern highways often feature overpasses that enable cross traffic to flow freely under or over the highway, thus ensuring an uninterrupted flow of traffic. The photograph below illustrates the construction of a divided highway with a crossroad overpass. 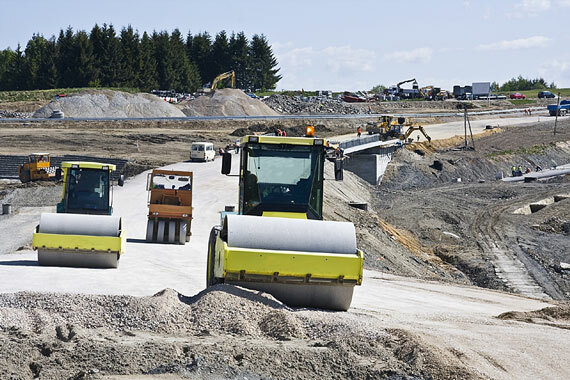 Road construction and maintenance are ongoing projects and tasks, and this road construction news page provides fresh context and perspective about road-building activities and issues around the world.